WS: Why did you start wakeskating over anything else? Obviously, you didn't like kneeboarding or wakeboarding or anything like that. J: You know, when Wakeboarding magazine started and the products started to first come out, and the riding style...it was...I was really riding with myself, frankly. I wasn't riding with a lot of people, and I didn't have a lot of friends that were into it. And I surely didn't know Josh [Smith], Greg [Nelson], and Collin [Wright] and all these people at the time that were riding and that were really killing it at the time. And it wasn't until the magazine came out that I could even see these people or anything. 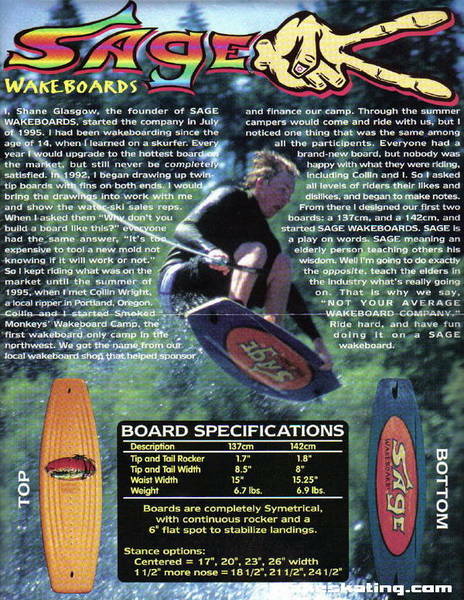 You know, before Wakeboarding magazine and before wakeboarding became popular I was really doing it by myself. And so when I was doing it by myself, I guess it was a little bit more creative for me to ride without bindings. You know, I was really into skating, and the Burnside Projects was just starting to go off. The skate scene in Portland was really good at the time in the 90's and stuff. To ride with bindings at the time just kind of seemed not really...it just seemed like, “Why?” You know, “Why ride with bindings?” Just, “Why?" [laughs]. And so that was just kind of my evolution. 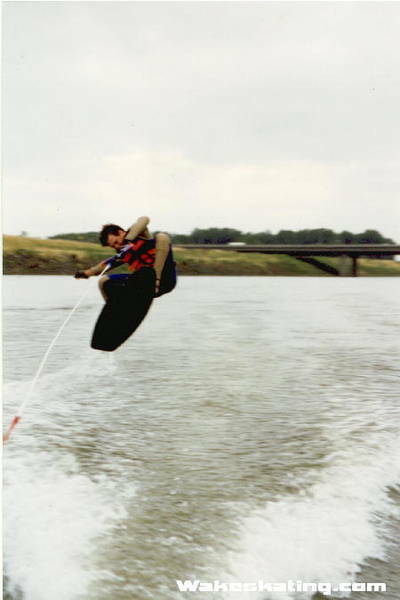 I definitely wakeboarded at the start but...after you ride without bindings, it's–especially way back then–it just seemed so right. There just didn't seem like there was anything that was what I wanted, and that was really all that mattered [laughs]. WS: Yeah, I think that mentality was probably very minimal at the time, because at that period of time there were also a lot of water skiers getting into wakeboarding, and I don't think they could really comprehend going bindingless [laughs]. 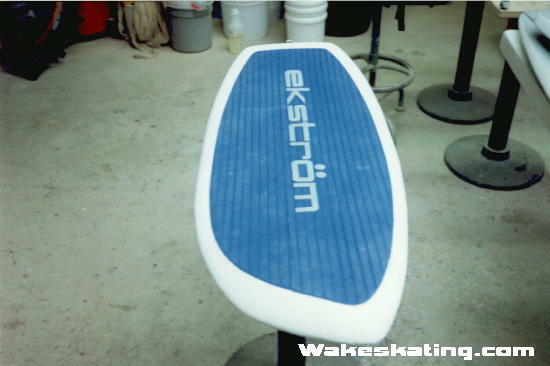 WS: What was the first wakeskate you rode on? I know you made some of your own boards, too, out of those surf blanks that you were calling around to the shops for. J: In like, 1994 I started shaping my own boards. I just had that Surf Alley already, and twin tips hadn't really come out yet, and it was just kind of a gray area. So I just decided to buy some Clark surfboard foam and start shaping my own boards, 'cause I really wanted a board with a concave top and kicktails in the board. And I wanted a light, light board that was very responsive. And I wanted it to look like a skateboard, in a way. You know, kind of thin throughout. And I wanted it to be a twin tip–-I wanted the same tip as it was on the base. But I wanted to have like a directional rocker line. So I had kind of started to shape boards, but had never done it before, and started cutting and shaping boards. And I would take them up to this guy in Mosier, Oregon just outside of Hood river. He was a really good windsurf fiberglasser, and he used to bulletproof fiberglass boards for me because they were so thin--the profile. And every time I'd bring a board he'd just be like, “Why don't you just cut these boards out of plywood?” or something, you know [laughs]? “And I'll fiberglass plywood for you and it will be bulletproof for you.” Because I'd keep breaking these fiberglass boards because they were so thin. Just that type of board, a shaped out foam blank surf board with a dished out concave top with a clean rocker line; man, that was just all the rage for me. I really, really liked that. But it took a lot for me to shape the board and it was expensive, like $100.00 to have them fiberglassed and stuff. But still, that was kind of how I started shaping boards. Just to try and make an actual board that had everything that I wanted. It was hard even to find small fins at the time. You know, I had to custom make small fins cause all these fins were raging. 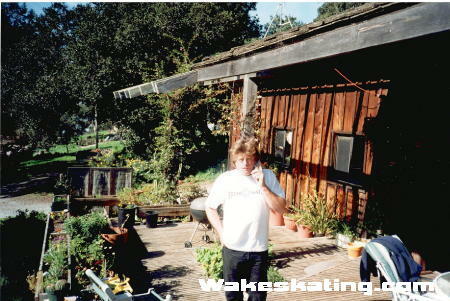 This particular deck is the first concave wakeskate Jason shaped, c. 1994. WS: Which year was that, by the way? J: This was '94, '95. I think that I ended up flying down--after talking with him for awhile--I ended up flying down, maybe spring break of '95 or something and actually met with Carl in Southern California–La Jolla. And he showed me all these boards he had been shaping for these flow parks. And he had been shaping boards for Kelly Slater and Tony Hawk, 'cause he had his pick of all these great riders because he was pretty connected. But yeah, he just got me hooked on these small, soft boards. And at the time I was just blown away by these, because I was making boards but they weren't looking like this, these high tech, super squishy and flexible, really right-on boards. At that time he told me that he worked with this guy named Stan Pleskunas. And about a year later or a couple years later he introduced me to Stan Pleskunas, who was kind of my mentor in life and taught me a lot about board making. As soon as I met him, that's when I started making killer boards that were very, very nice boards [laughs]. The problem is that they were custom, and we weren't about making a lot of boards I guess, at the time. It was about making a few good boards and not a lot of bad boards [laughs]. WS: So did you sell those few custom boards that you had, or did you keep them all for yourself? J: Umm...for myself and my friends. 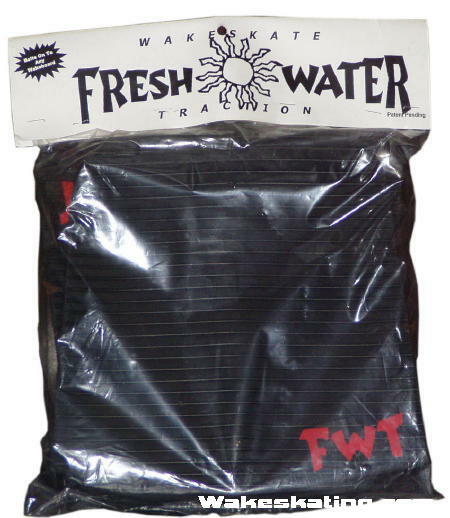 I didn't go into production board making under the Fresh Water name. WS: And up before you met your mentor, you didn't have any shaping experience, I take it? That was kind of a trial by error thing? J: Yeah, exactly. When I was shaping my own boards I was basically outlining skateboards and blowing them up at Kinko's, and making big templates, and cutting big skateboards out of foam blanks. And then I made these jigs-- I made these wood sanding things so I could make concave out of the top sheet. And I would just–each board I would mess around with the rocker line, like I kind of copied this Surf Alley rocker line in the beginning, and then I'd see how that board rode. If it rode a little too tall or a little too high in the front or whatever, I'd mellow it out a little bit. At the time I was into big rocker; big rocker was kind of popular back then, and I definitely pushed the rocker boundary [laughs]. But yeah, exactly. This is all trial and error. And that was all right about the time the twin tips were starting to get into the picture, and that's when everything kind of changed for me. And that's when the real wakeskating story starts. WS: Just to clarify, you basically started shaping your own boards in '94, '95? Legendary shaper Carl Eckstrom and his freshly shaped flow boards. J: I think they were in Norway or Sweden. WS: Yeah that could be it. It was like Terje and Chris Miller and Tony Hawk and..
J: Yeah, that's the Endless Wave. That's still the largest wave. Well, my friend, Stan Pleskunas, basically, he made the Swatch Watch movable flow park. And Stan's also responsible for making a lot of the flow parks that are out there. He was really a big part of that whole flow park. It's funny, just like anything—Stan and Tom Lochtefeld, Carl—they all grew up in the same area, you know, Southern California. Now Tom owns Wave Loch, and Stan's an inventor, and Carl's still a board guru and stuff. So it's funny like that [laughs]. WS: That's awesome how that worked out though. J: Yeah, definitely. Well, that–I was definitely inspired by that whole artificial riding, like...not artificial, but kind of riding stuff that had never been ridden before; riding a wake behind a boat without bindings; riding on a pre-made wave that's shaped over concrete. It's just that whole–all these things that were happening, that whole thing just kind of reminded me of the next generation of water parks. You know, where we actually go to skate; you'd go to a water park to skate. You know? You have these disciplined new types of play lands. That was kind of where I'm going with it. That's where, that's the vision [laughs]. WS: Yeah, that's awesome! 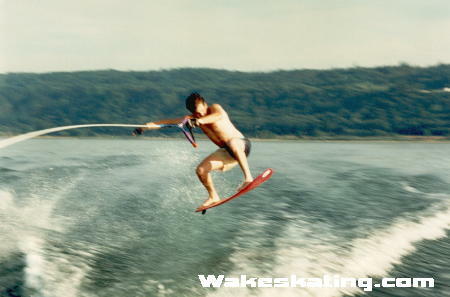 When you started, were there any other people that you were able to wakeskate with, or was it just you? Or like early on, it was just you, but how about later on like when you started to make your boards. Who were you able to ride with? J: [Laughs] Right. You know, other than my skater friends that were skating down at Burnside, my dad had a boat and every once in awhile I'd take out some of my friends that were way more into skating. J: Yeah, Shane. I basically heard that there was a wakeboard company in town now called Sage wakeboards or whatever, so I got in contact with him. And I had been hanging out at this surf shop in town a little bit, and working on my boards in town and patching them up, or whatever, at this surf shop. And I had been riding with a couple kids down there, and they were starting to get really stoked on it, too. And then I hooked up with Shane and met with Shane, and he was showing me his boards and stuff. And they just so happened to be having a demo like that next week or whatever–Smoked Monkey's demo. And I went down there and that was the first time that I brought my traction pads and I already kind of had my traction pads; I was already making them. I brought some down and I brought a couple boards down and...seriously, this was when we were still riding directional boards–I was still riding a directional board [laughs]. You know, Blindside came out with a twin tip board and just a couple–there was twin tip boards out, but it was right at that transitional time, you know [laughs]? If you needed traction in the mid to late 90's, this is probably what you would have bought. WS: Maybe like twin tips that didn't have the nose fin or whatever? J: Well, I loved surf-style boards, the directional boards, because you could put your feet all the way back on the board, and you could get good ollies that way, you know? And when boards kind of became centered it was a little bit tricky because there was a lot more tail then and it was like, “Ahhh!" [laughs]. So I still rode directional even on twin tip boards because I had to work with the bolt pattern a little bit because I was bolting on these traction pads and stuff. Anyways, that was the first day I met Collin. I went down there with..oh wait, I don't even think I met Collin that day. I really didn't officially meet Collin and officially show him my stuff until the Expo of '96. And I had already talked with lots of other people by then [laughs]. That was interesting. But anyways, yeah, there really wasn't a whole lot of people I rode with for years and years, basically [laughs]. To proceed to section three, click here.